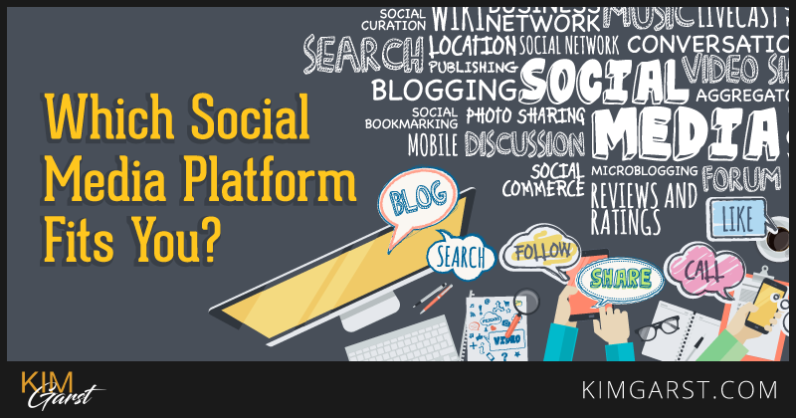 Which Social Media Platform Fits You? Wondering which social media platform you are most similar to or which you should focus your efforts on based on what you are looking to get out of it? Take this quiz that I created with Riddle and see for y ourself! There are now seven main social media tools you can use to promote yourself and your business. But you can’t fake authenticity, so which tool will allow you to truly be yourself online? You might be expecting us to be describing you as short and to the point but that would be a tall story. We know you are much more focused on sharing and caring. Twitter is all about focusing on specific subjects and bringing in the intelligence of crowds. Of course there are negative elements but we trust you to rise above that with style and grace. Just remember that hashtags are your friend! Kick your new Twitter campaign off with a bang with this report – How To Use Hashtags On Twitter To Grow And Market Your Small Business by Forbes Top 10 Social Media Influencer Kim Garst. You, more than most, are more likely to focus on sharing useful information rather than photos of cats playing chess! You also have a fascination with people. More that you have a long term plan to your social media time. In fact it is more likely to be classed as networking than playing on social media! Kick your new LinkedIn campaign off with inside knowledge from Forbes Top 10 Social Media Influencer Kim Garst’s Social Selling Inner Circle. All the world’s a stage and you know it’s better to have 15 minutes of fame rather than 15 seconds! The fascinating thing about YouTube is that it works for both introverts and extroverts. And this appeals to your well-structured approach to life. So it’s time for camera, lights and ACTION! Kick your new YouTube campaign off with inside knowledge from Forbes Top 10 Social Media Influencer Kim Garst’s Social Selling Inner Circle. You know that people buy from people and you’re not shy in putting yourself out there in the name of fun and business. This is why Instagram is such a good match for you. Your laid-back artistic streak is a natural fit with Instagram – just make sure you know the best hashtags! Kick your new Instagram campaign off with inside knowledge from Forbes Top 10 Social Media Influencer Kim Garst’s Social Selling Inner Circle. Now you see me, now you don’t! You’re an ‘in the moment’ type of inspirational person who likes living in the here and now. This makes you perfect for the exciting medium of Periscope. There’s no need to plan for hours if you already know what you’re going to say! Kick your new Periscope campaign off with a bang with these Periscope 101 Jumpstart Guide by Forbes Top 10 Social Media Influencer Kim Garst. A natural-born collector, displayer and explainer; you can use pictures to say a great many words about yourself and your product. A friendly soul, you are open to collaboration and fun win-win situations. And we know that people will love sharing their lives with you. Kick your new Pinterest campaign off with inside knowledge from Forbes Top 10 Social Media Influencer Kim Garst’s Social Selling Inner Circle. You’re the sort of jack-of-all-trades that gets on with everyone. You probably don’t have a problem with mixing business with pleasure. After all, people are happy to spend money when they’re having fun! You’re a great friend and a fun colleague. What’s not to like? Kick your new Facebook campaign off with a bang with these 27 Killer Facebook Post Ideas For Small Business Owners by Forbes Top 10 Social Media Influencer Kim Garst. What do you most want from social media for your business? Not to get fired for posting the wrong thing! And what do you enjoy most about social media? What are you least likely to be selling? Which really annoying thing are you most likely to share? What is the most powerful thing to collect? Had fun? Share it on Social Media! After you’ve taken the quiz, feel free to share it so we can see what results your community gets as well! I’d love to hear which social media platform you got! Comment below! Did you give Pinterest a try? I got Twitter and that’s a great result about me. Stumble Upon is a good alternative for all my social media needs.It has got nice PR and good social networking capabilities. Hi Kim, I got Facebook. Great little quiz. Have shared on Twitter. Well this is kind of ironic, isn’t it? Haha. Look what Fred Harrington just posted..Effective SEO in 2016: Guest posts are out! Editorial Links are in! I got YouTube but I’m obsessed with Periscope. Although I find that my topics of Body & Mind Detox get very deep & it’s annoying for me to see viewers coming and going throughout my talk on Periscope lol! Don’t get discouraged, Joy. Keep scoping! Pinterest works on recipes and fashion—I’d tried this before. I got Linked In – not what I would have guessed? And not sure that’s best for my business. But – a good learning exercise for sure! Glad it was useful to you, Jessica. I knew it! I got Twitter! Now I can really kick it up a notch without thinking I have to placate the other social media sites too! I took this quiz and got Instagram. Cool, because I’ve always loved it. However, I’ve always struggled with consistency on that platform so my follower count is slow and not always steady. Solutions for those who want to keep images authentic and not preplanned? Social Media is the place where all the marketing ends but at the same place our branding starts. Personally, I believe that both Marketing and Branding go hand-in-hand. The first day when you start marketing, your effort to build the brand should also begin. I really like what you have to say here Kim! It was a great read and you really did quite a good job of sharing great tips in using social media. Thanks for sharing. Thanks for dropping in, Dmitry! Hmmmm I got Periscope. Something I’ve been a tad shy to try, until now. Guess I better add it to my bucket list. This was fun. Go for it, Shelley! Glad you enjoyed it. Too funny – I got Periscope. I started “scoping” a few weeks ago. Just watching and listening for now, taking note of what works and what doesn’t for others in my space. I want to get more comfortable with it before I dive in and host This little quiz surprised me and affirmed that I may be on the right track. Thanks Kim! I got Periscope, interesting – I have never tried that one so I will give it a whirl! Love the test! Give it a try, Lori and have fun with it! Just downloaded it – thanks again. Great article on social media! Very informative, thanks for sharing! Your quiz gave me LinkedIn which is my least favorite platform. I will have to look into it again. I think one of the reason it “viewed” me as a LinkedIn person is because I am very unlikely to sell podcasts. After all, I’m deaf and podcasts are useless to me so why would I want to sell something to anyone that is worthless to me? Thanks for sharing ,very informative article on social media ! great post!! thank you so much for sharing sharing such post. I love Pinterest, I earn good traffic from here. I never try Instagram and I think I should try them too.